A child who is coughing and congested can be a very unhappy camper. Although there is a plethora of medicines in the pharmacy that say they are for colds, they are not very effective and can have side effects. I would advise you not to use any over-the-counter cold medicine, especially if your child is less than 6 years old (click here for more information). If your child is older than 1, tea with lemon and honey or chicken soup can really help and don’t have any side effects. Having your child breathe in the steam of a hot shower or humidifier/vaporizer can also provide some relief. When there is any degree of respiratory distress or labored breathing, this is a completely different story. If your child is breathing so hard that you can see the ribs pulling in or the nostrils flaring, this could indicate pneumonia, bronchitis, or asthma. These situations cannot wait until the morning. You need to go to the emergency room immediately, so that a doctor can check your child’s oxygen level, listen to his lungs, and take a chest x-ray if necessary. A very common time for children to develop constipation is during toilet training. If too much pressure is placed on a youngster, they may subconsciously rebel by holding in their stool. This leads to their bodies absorbing more water, which makes the stool get harder. The harder it gets, the more the child will hold it in, and on and on it goes. A sore throat could indicate strep throat. This bad guy has been around forever, causing sore throat, fever, and swollen glands. 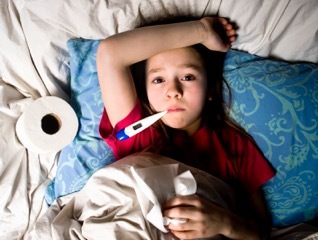 When there is also a cough and runny nose, this indicates a viral infection, which actually points away from strep. But kids that are older than 2 and complaining of fever and sore throat should be seen in the office, just in case a strep test should be done. Strep throat is highly contagious and, if left untreated, can bring on rheumatic heart disease. If your child has a sore throat and fever but is breathing normally, make an appointment for first thing in the morning. In the meantime, give them Tylenol or Motrin for the pain (click here for dosages), and tea with lemon and honey to soothe the throat.